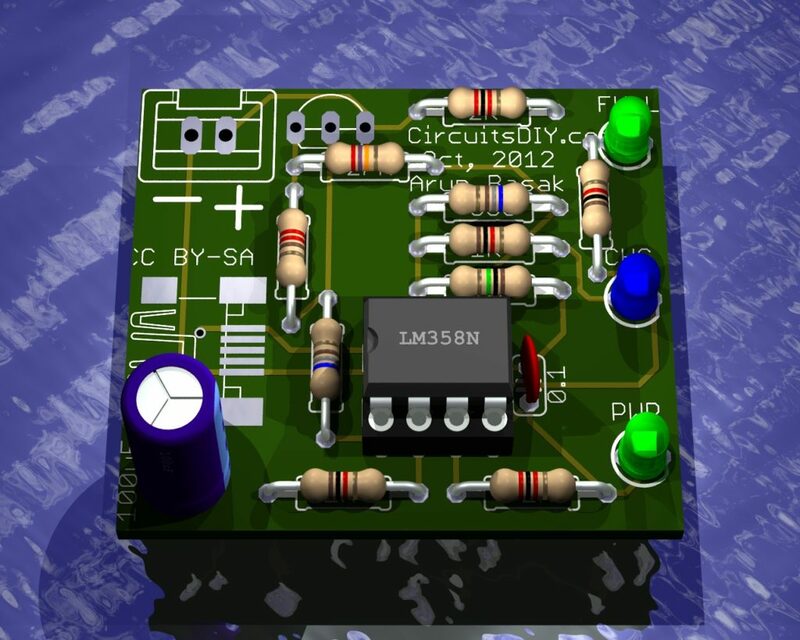 What software is this for 3D visualization of PCB? It’s done using Eagle3d and POV-Ray. I am Nelson from Malaysia/Kuala Lumpur. I am not a complete electronic wizard but I am a handy man in every ways. LED 1 set 40pcs -3.2-3.5V each – 6 sets. Solar panel 1pcs – 7 Volt X 1W X 150mW – 6 or 8 pcs. 12 Voltage Lead acid or any rechargeable battery. I would like to make night light-up with this 240 high bright LED. To tell the truth. I am average in calculating, not much knowledge on components and don’t really know how to begin. The circuit board for 40 LED will be on a 3″ in diameter circle shape board. Other components…. I am not sure? Solar Panel 2.5″ x 4″ – 1 pcs. There should be a light sensor with relay to enable battery usage at night. Battery …you recommend it. Lead asid 12V x 4.5 AH or any… as long it is not as car battery size. To be frank… I would like to light up my Parents Tomb which I will be making from Glass and acrylic. I want it to be lighted up at night everyday. Tell me how can we go about. Give a shout by the “Wish a Circuit” form and we can discuss it. Replace the transistor to a higher Ice one. I’ve built your circuit just as you show in your schematic, with the exception that I’m using a barrel jack connector, and a 5V switching power supply purchased from Sparkfun.com. When I test the voltage coming from the part of your circuit that you use to charge the battery, it’s reading 3.77 Volts…is this correct? 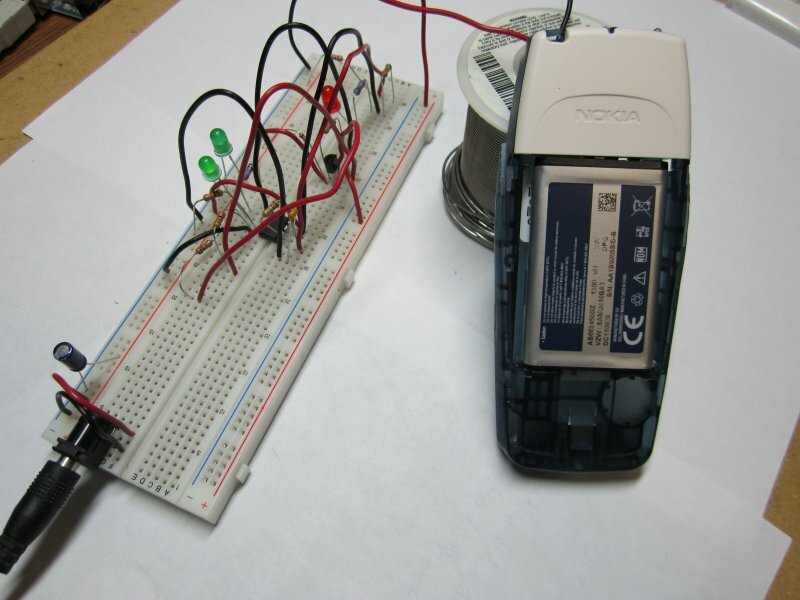 I had a ‘dead’ (measure 0V) Nokia 3.6 battery and the circuit seemed to work. However, when trying to charge a newer Samsung 3.7V, it doesn’t seem to work. When fully charged, the battery reads 3.99V. I put it back in the phone until it was about 3/4 full…which it then reads 3.79V. When I connect it to the charger, it doesn’t seem to do anything. Is this because the charger is outputting less voltage (3.77V)? I’m very new to electronics, so forgive me if this is a dumb question. Thank you for sharing your circuit though, hopefully I can use it eventually. The resistor values are critical. Use exact and not near valued resistors and it would work. At full charge a 3.7V li-ion measures 4.0-4.2V, so it’s no problem. I did use exact resistor values…however they have 5% tolerance…is that too high? Is the following transistor ok? The linked transistor is the same as used in the circuit. Everything looks fine (I didn’t analyzed circuit design which I assume you followed correctly). 5% tolerance is fine as the resistances remains constant when temperature is constant in these applications where resistors doesn’t get heated. Just check every resistor once in multimeter to be sure there are no faulty ones whose value is junk. There are two 2K resistances in board but 2K is not a popular value, you can replace by 2.2K (nearest one) but you need to use 2.2K in both places. PS: Can I show your prototype (2nd image) in this website under user gallery? I checked all the resistors with my multimeter and they appear to be fine. I did use actual 2K resistors (I bought them specifically for this circuit) on this prototype. The battery voltage is measured through R3-R4 voltage divider (the 2K ones). I suggest you replace R4 with a 2.2K pot and set the value to slight less than 2K. 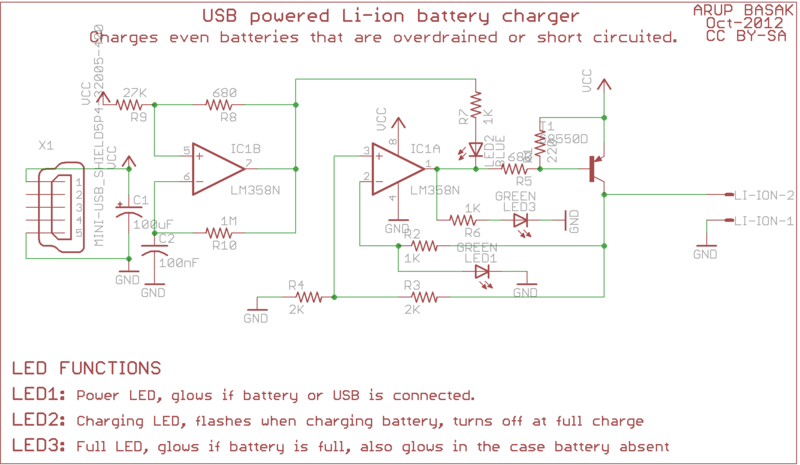 Then the circuit will charge the battery to a bit higher volatge. After some tries you’ll reach to a specific value say 1.8K which will charge your battery to 4.2V(full charge). Then replace the pot with a fixed value resistor of that value. Sorry for late reply and Happy new year to you. Now this thing is even confusing me. If you had it working on breadboard with same diagram as in the PCB, it will work the same as breadboard. Then you just had to calculate the new resistor value for your desired voltage and replace a 2K resistor. 2K, 2.2K both are fine. Is there anything specific about transistor used, S8550d ? These are not very popular in Poland, can I use any similar PNP transistor (with respect to its pinout) ? You can use any general purpose PNP transistor, just make sure they have enough current rating. For example, the S8550D is rated for 1.5A, while BC557 has 100mA and BD140 has 1.5A rating. So, use BD140 and mind the pinout. thank you for this charging circuit. I just finished it with BD140 and 2.2k for R3,R4. Now I measure only 3.73V without battery connected from collector to ground. How can I set charging voltage to about 4.2V? Just soldered a pot in fpr R4 at 1.8k and testing. The battery charges, my yellow led is on but not flashing? Any suggestions? I guess you used yellow in place of blue LED. Try altering the value of R8 to fix the issue. The charging led doesn’t lit at all. What i done wrong? Is it possible to make 12v ac 2A from 230v ac without transformer? I would like to use full power of s8550, it means a 1, 5 ampere charging current. I have strong 5V power supply, which can deliver about 2A of current. How can I change Your schematic, to obtain current of 1 to 1,5 ampere? I need such a high current, to charge high capacity 18650 Li-Ion cells. Thanks in advance for Your reply. can I use some other transistor like a 2n3904? as this transistor doesn’t seem to be very common. 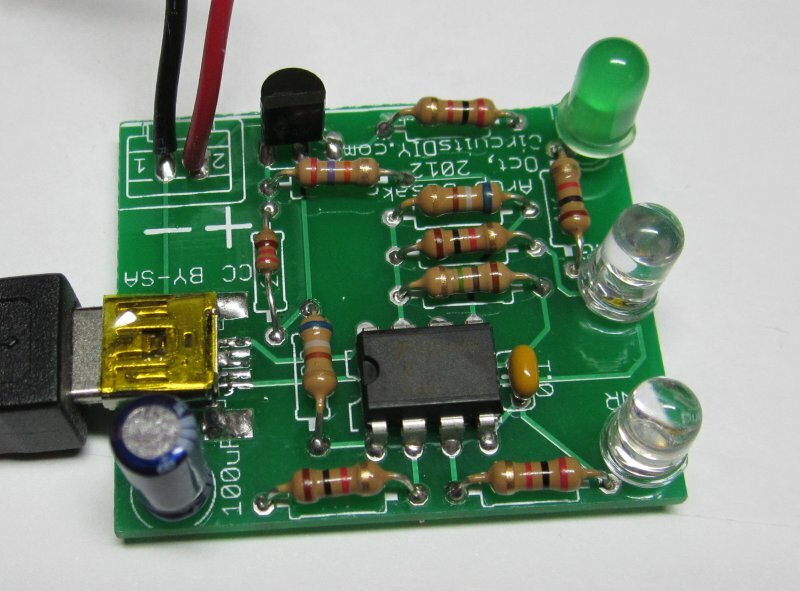 Hello I built the circuit exactly how you stated but i used a TIP2955 instead. my output power was very low but when i removed LED 1 the voltage a lot more to what i would like. However i am only getting a 80mA out but i would like something a lot higher. Is there anything you could suggest that could help me fix these problems please? I just have a question, i done this circuit on my breadboard, but my exit tension is something like 3,6v is this normal? that’s because the finish led light up until my battery reach 100% of charge.. maybe 30% or 40%… I’ve read somewhere on internet that this chargers has a 4,2v and 10% of the current on output… I’m alone-home-learning electronics and hope your help for my project.. by the way, my batteries are 2x 3,7v 3000mah parallel connected. how can i control the charging current & voltage for 8.4v?